Introduction: Rasasindura (RS) is one of the unique mercurial preparations commonly used in Ayurveda therapeutics. The traditional procedure followed for preparing RS in the classical furnace has several drawbacks, such as difficulty in controlling temperature, consumption of large quantity of fuel, and excess human effort. Aims & Objective: The present study was conducted to evaluate an alternate method to prepare RS by using an electrical muffle furnace (EMF) and to standardize this method. Materials and Methods: RS was prepared by adapting similar temperature pattern in both the traditional and EMF methods, and observations were recorded. Obtained product was subjected to orgennoleptic and physico-chemical analysis. 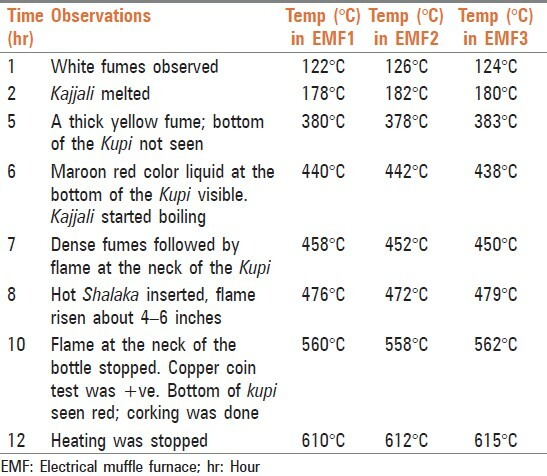 Result: No remarkable differences were seen in observations of both preparations, except the melting of Kajjali, appearance of flame, and appearance of desired characteristics of product formation, which were observed at 190, 496, and 567°C in the traditional method and at 180, 473, and 560°C in EMF, respectively. 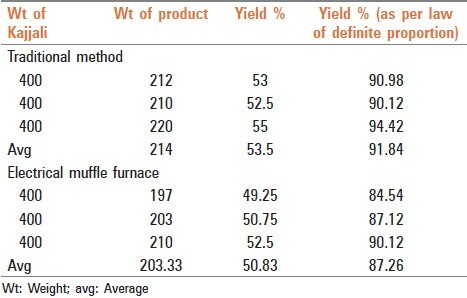 Yield of the traditional method was 53.5% whereas in EMF, it was 50.83%. Organoleptic and physicochemical analysis revealed no significant deviation in values. Conclusion: The present study reveals that the traditional method of preparing RS can be effectively replaced by the EMF with some added advantages. Rasashastra , the pharmaceutical science, deals mainly with the processing and therapeutic utilization of mercury, metals, and minerals. It aims at designing novel drugs with better curative attributes at minimum doses. Kupipakwa rasayana is a unique pharmaceutical preparation wherein the drug is prepared in a glass bottle called kupi and the processing is done in a traditional furnace with a gradual rise in temperature. Rasasindura (RS), most commonly used in Kupipakwa Rasayana is a sublime product of a mixture of mercury and sulfur, and due to its wide therapeutic utility, it is used in several formulations. The therapeutic repertory ranges from treating diseases like diabetes mellitus, indigestion, fever, urinary tract infection, and respiratory infections to alleviating aging as an aphrodisiac and rejuvenator. 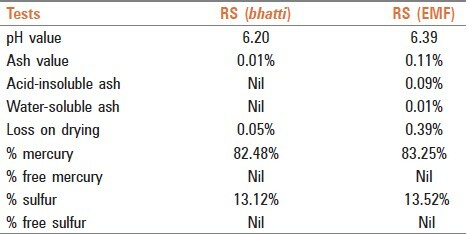 The traditional furnace used to manufacture RS is known as bhatti and fuel used is either hard or soft coal. Difficulty in controlling the temperature, large amount of fuel consumption, exposure of the personnel to heat, and air pollution are the drawbacks in the traditional method. With advancement in pharmaceutics, replacement of the fuel and instrument by more efficient instruments such as the electric muffle furnace (EMF) may be considered, which has benefits like easy handling, temperature control, control of air pollution, and reduction in human effort. The above points can prove the edge of EMF over the traditional method, but the real facts can only be revealed by a detailed comparative study. Previously, a study had been carried out on the standard manufacturing process of RS on a large scale in the traditional method. However, they did not replicate the same on EMF. Therefore, a comparative study was conducted in both the traditional furnace with coal as fuel and vertical EMF to evaluate the gradation of temperature and total duration of paka, and variation in the processes and yield; a comparative pharmaceutical standardization of the same was carried out. Ashuddha Hingula (raw cinnabar), Ashuddha Gandhaka (raw sulfur), and cow's ghee were procured from the Pharmacy, Gujarat Ayurved University, Jamnagar. Nimbu (Citrus medica Linn.) was purchased from the local market in Jamnagar. Vatajata (Ficus benghalensis) was collected from the botanical garden of the Gujarat Ayurved University, Jamnagar. Parada (mercury) extracted from cinnabar,  Shodhana of Gandhaka,  and preparation of Kajjali was carried out as per classical references [[Figure 1]a-c]. Kupi (glass bottle coated with 7 layers of mud-smeared cloth, capacity: 750 mL), Bhatti [[Figure 2]a] (diameter: 5 cm, height: 85 cm, upper hole: 18΄18 cm 2 for filling coal, lower hole: 20΄20 cm 2 for collection of ash and connecting blower), Valuka yantra (iron vessel filled with sand for placing the kupi) [[Figure 2]b] ( diameter inner: 20 cm, brim: 30 cm, height: 30 cm, depth: 27 cm, thickness: 03 cm), Valuka (sand with mesh, size: 10), charcoal, coal, and EMF- [[Figure 3]a and b] inner hearth (length: 15 cm, breadth: 15 cm, depth: 30 cm, max. temp. capacity: 1000°C) were collected as per the classical references and requirement. The preparation of RS is divided into three stages, namely, preoperative (Purvakarma), operative (Prdhanakarma), and postoperative (Paschatkarma) stages. RS was subjected to various organoleptic and physicochemical analyses like texture, color, taste, odor, pH, ash value, acid-insoluble ash, water-soluble ash, loss on drying, and percentages of mercury, free mercury, sulfur, and free sulfur. Extracted mercury and purified sulfur were taken in an appropriate ratio [Table 1] and [Table 2] and triturated in an iron mortar till the whole mixture was converted into a fine black, lustreless powder (Kajjali). Then this mixture was levigated three times with Vatajata swarasa (juice of F. benghalensis). Four hundred grams of Kajjali was filled which was upto one-third of the Kupi and was placed on a traditional furnace in such a way that the neck of the kupi remained just outside the sand, and in EMF, the Kupi was placed in the center in such a way that the kupi could receive equal distribution of heat. Preparation of RS by the traditional furnace  was begun by igniting charcoal in a controlled intermittent manner and gradually increasing the temperature. Initially, 4 kg of coal and 2 kg of charcoal were used and at definite intervals, a fixed amount of fuel was added for maintenance and increment of temperature. A pyrometer was inserted into the sand of the Valuka Yantra employed to record the temperature of the furnace at regular intervals. A blower was also utilized to facilitate the increase in temperature; initially, three hours of mild (120-250°C) and moderate temperature (250-450°C), and lastly, an intense fire at a temperature of 450-600°C were used [Table 3]. A red-hot iron rod was repeatedly inserted in the neck of the bottle so as to burn any accumulated sulfur there. After observation of the confirmative test, the mouth of the Kupi was corked and the temperature was increased to around 50°C to facilitate sublimation of the final product inside the neck of the Kupi. This temperature was maintained for a minimum of two hours. After adequate cooling, the bottle was removed and thus RS was prepared in three batches of 400 g of Kajjali in each. In the preparation of RS by EMF,  the temperature pattern standardized by the traditional method was followed and the pattern of gradual rise in temperature was also used. Observations were recorded, and in the same way, two more batches were prepared to ensure a standard manufacturing process. On the next day, after self-cooling, the bottle was carefully scraped, broken, [[Figure 4]a] and the product deposited at the neck [[Figure 4]b] was collected and weighed. Different phases of the desired characteristics during the process were observed, namely, sulfur fuming [[Figure 5]a], melting and boiling of Kajjali, flame, and confirmative test (flame disappearance, Shita shalaka test, red-hot appearance of the bottom) [[Figure 5]b], and copper coin test [[Figure 5]c] were observed and recorded in both the traditional and EMF method [Table 4] and [Table 5] [Graph 1]. RS, collected from the neck of the Kupi from all the batches by both the methods were weighed and calculated for the percentage of absolute and relative yield and tabulated [Table 6] and also subjected to various organoleptic [Table 7] and physicochemical parameters [Table 8]. In the traditional method, after first three hours of mild temperature, light white fumes were observed initially that gradually thickened. On probing with an iron spoke, it was observed that the Kajjali melted at around 190°C, whereas the same stage was observed at 180°C in the EMF method. During moderate temperature, dense yellow fumes were observed and the bottom of the kupi was not seen. In later stages, the bottom appeared maroon in color as seen using a torch. On gradually increasing the temperature, the Kajjali started to boil and frequent deposition of sulfur was observed at the neck of the Kupi. Dense fumes were observed in the traditional and EMF methods at a range of 467-482°C and 450-458°C, respectively followed by flame. With the increase in temperature, the height of the flame increased by 6-8 inches [[Figure 2]c] and 4-6 inches [[Figure 3]c] in the traditional and EMF methods, respectively. This variation of height of the flame in the traditional method may be due to environmental factors like open air circulation. Duration of the flame was for two hours 10 minutes and two hours 24 minutes on an average in the traditional and EMF methods, respectively. 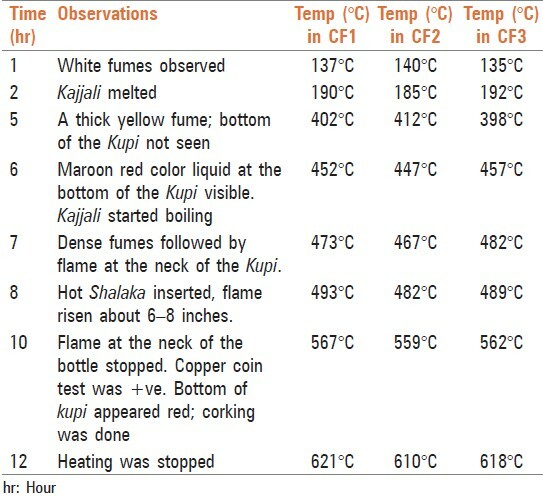 Confirmatory tests like disappearance of flame, Sheeta Shalaka test (dry appearance of iron spoke inserted into the kupi and taken out), copper coin test (completion of product formation confirmed by placing a copper coin which is determined by color changes on it), appearance of red-hot bottom and movement of the product in the kupi were observed at around 559-567°C and 558-562°C, respectively, in the traditional and EMF methods. Disappearance of flame and Shita Shalaka test (+ve) during the process indicated no free sulfur available inside the Kupi. Reddish color at the bottom of the Kupi indicated that material was converted into compound form. The copper coin test (+ve) is also one parameter of free sulfur test. Here, the not able point is that the observations in EMF were seen slightly earlier with respect to temperature than the traditional method, which may be due to installation, designing, and operational differences in the instruments. The heating pattern of the both methods differ, as in the traditional method, indirect heating process is adopted whereas in the mechanized method, a direct heating process is used. In the traditional method, the heat reaching the bottle is through Valuka (sand) which maintains a steady temperature throughout the procedure. Here in the traditional furnace, the difference in temperature gradient from the bottom (relatively more hot) to the neck (relatively cool) of the bottle was observed, whereas in EMF, the electric coils heat the bottle directly and distribute the temperature equally throughout the bottle. The time required to complete the procedure was 12 hours in both the traditional and EMF methods. Although Kramagni is mentioned in the classics which is interpreted as intermittent gradual rise of temperature and equal amount of heat at all three stages of heating, mild and moderate stages are for three hours each and increased heat for six hours to facilitate enough time for digestion of sulfur and to avoid delaying of the procedure. Practically, moderate and intense stages are more essential in the heating process, as in this stage, maximum chemical reaction and compound formation take place. Average yield in the traditional method was 53.5%, whereas it was 50.83% in EMF. Removal of sand around the neck of the kupi in the traditional furnace facilitates deposition of the sublimated product by providing a cooling surface, whereas in the case of EMF, there is equal distribution of temperature from bottom to neck, which may result in dissociation of some product at the neck at high temperatures (beyond sublimation), if not controlled appropriately. This may be one of the reasons for relatively less yield by the EMF method. In the traditional furnace where the temperature is maintained manually and is dependent on the amount of coal used, it is very difficult to maintain the desired temperature, whereas in EMF, the system supports maintaining the temperature through automated control; the desired temperature once set will be maintained till further operation. This precision in temperature ensures the proper formation of the product. The amount of coal required is 5 kg of charcoal and 15 kg of hard coal (15 Rs/kg); so, the cost is about Rs 300/procedure as per existing rates. Moreover, in the traditional furnace, the energy required is more, as loss of heat due to radiation walls, sand, and iron vessel will add to greater consumption of fuel. The usage of electricity is 1.8 units/hour ΄ 12 hours at 8 Rs/unit; hence, total cost is around Rs 172.8/procedure. So, EMF, along with other advantages over the traditional furnace, is also cost effective. Heat radiating through the traditional furnace during moderate and intense stage is very high, which will harm the personnel if exposed for a long duration of time. This problem in EMF is solved through an insulating layer, which prevents escape of heat. Working with such a modified method not only serves for better fuel efficiency and a pollution-free process, but also reduces human labor and exposure to heat. In the traditional method, all the observations and stages are clearly distinguished, whereas it is not so in EMF. For yield and observation, the traditional method has an edge over EMF, but in terms of fuel, human effort, and pollution, EMF is a better option. However, the few drawbacks in EMF like even distribution of temperature and not sufficient cooling surface over the neck of the bottle for collection of the product can be solved by modification of the technical design. Results of the organoleptic studies of RS were similar [Table 7], whereas physicochemical studies [Table 8] showed a slight deviation in the values which is not significant enough to comment. However, advanced analytical studies maybe carried out to detect minute differences. Clinical study of RS prepared by both the methods can be studied comparatively to ascertain efficacy. RS can be prepared in 12 hours by adopting a pattern of three hours of mild and moderate and six hours of intense temperature in both traditional and EMF methods. The traditional method is better in terms of yield, but EMF has advantages such as better maintenance of temperature, saving of energy, cost effectiveness, less human effort, and it is environment friendly. By comparing yield, and organoleptic and physicochemical studies, it is clear that the traditional method can be effectively replaced by EMF. 1. Mishra S. Somadeva's Rasendra Chudamani. Varanasi: Chaukhamba Orientalia; 2004. 1/33, p. 9. 2. Jha CB. Ayurvediya Rasashastra. Varanasi: Chowkambha Surabharati Prakashana; 2000. p. 173. 3. Shastry K. Sadananda Sharma's Rasa Tarangini. 11 th ed. New Delhi: Motilal Banarasidas; 2004. 6/160-168, p. 140-1. 4. Yadav P, Vyas M, Dhundi S, Khedekar S, Patgiri BJ, Prajapati PK. A quality control parameters of Rasasindoora. Int J Ayurvedic Med 2011;2:72-80. 5. Mehta NJ, Patgiri BJ, Prajapati PK. Standard operating procedure of Hingulottha Parada. Int J Ayurvedic Med 2010;2:27-36. 6. Kulkarni DA. Vagbhata's Rasaratnasamuchchaya. New Delhi: Meharchanda Lachmandas Publication; 2010. 3/20, p. 45. 7. Kulkarni DA. Vagbhata's Rasaratnasamuchchaya. New Delhi: Meharchanda Lachmandas Publication; 2010. 8/5, p. 145. 8. Shastry K. Sadananda Sharma's Rasa Tarangini. 11 th ed. New Delhi: Motilal Banarasidas; 2004. 6/168-175, p. 136. 9. Dasondi M. A comparative pharmaco-chemical study of Samaguna and Shadaguna Balijarita Rasa Sindhoora w.s.r.to its toxicity. Jamnagar: IPGT and RA. Gujrat Ayurved Univesity; 2002. 10. Milczarek M, Kosk-Bienko J. Maintenance and occupational safety and health: A statistical picture. Luxembourg: European Agency for Safety and Health at Work; 2010. p. 6.